The Academic Celebration commences with the Annual Student Exhibition Awards Ceremony and Reception on Thursday, May 5, 2016 in RGL 209 and 215 at 3:00 PM. Professors nominate one paper, poster presentation, PowerPoint presentation, or media/short video from each course taught during Summer 2015, Fall 2015 and Spring 2016 semesters. A faculty committee selects approximately 25 student projects to be presented as poster presentations, PowerPoint presentations, or media/short videos for viewing at the Exhibition Awards Ceremony and Reception. Projects remain on exhibit in Lewis Hall throughout Commencement week. The Student Exhibition includes all Price School undergraduate and graduate courses. Select groups of students will be invited to participate in the Symposium, which is held the day before Commencement — on Thursday, May 12, 2016, from 12 noon to 2:00 PM at various locations in Lewis Hall. 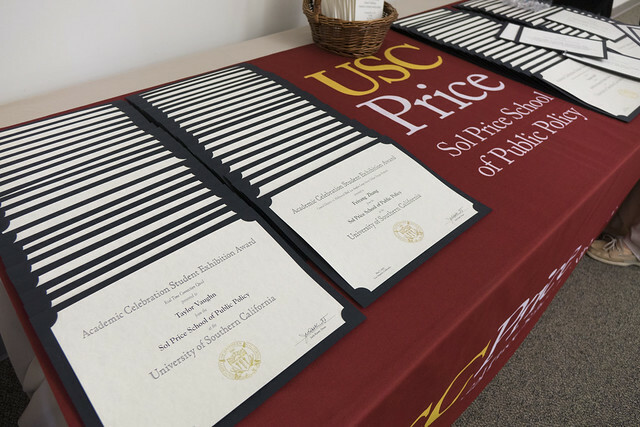 USC Price recognizes outstanding undergraduate and graduate student performance at the Annual Academic Awards Ceremony, which takes place on Thursday, May 12, 2016, from 3:30 PM to 4:30 PM. Students earning awards will receive an invitation to attend the ceremony. Week-long Price Academic Celebration concludes with a school-wide reception immediately following the USC Price Academic Awards Ceremony on Thursday, May 12, 2016, from 4:30 PM to 5:30 PM.